TV show dates: January 6, 2009 — present. Performers include: host John Quiñones. Actors include Yuval David, Diana Henry, Vince August, Jeremy Holm, Traci Hovel, Hassan Goding, Christopher Peuler, Kristin Rose Garofalo, Lorraine Rodriguez-Reyes, Kaira Klueber, Anthony Ippolito, Ben Curtis, Paulina Gerzon, Nicolette Pierini, Ava Giacchi, Aiden Medina, Tyler Hollinger, Pearl Thomas, David Kremenitzer, Michael J. Lyons, Kevin T. Collins, Dawn Yanek, Zach Meliani, and Annie Hall. Beginning as a feature in ABC’s Primetime newsmagazine series, the What Would You Do? TV show explores how people react to strangers in uncomfortable circumstances. With hidden cameras at the ready, actors play out various scenarios, in front of unwitting bystanders. The series seeks to discover how and when people feel they must intervene and when and why they choose to mind their own business. John Quiñones reports about how they made their decisions. Scenarios include situations with harsh parenting, bullying, controlling spouses, verbal abuse, and more. What do you think? 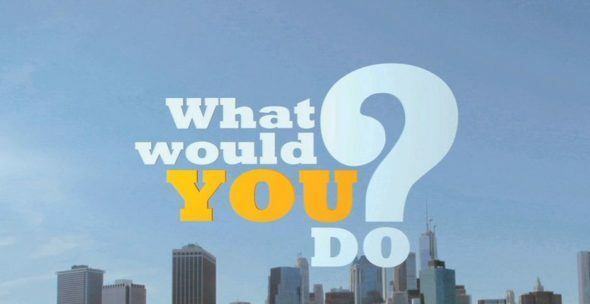 Do you like the What Would You Do TV series? Should it be cancelled or renewed for another season on ABC? I LOVE this show, please don’t cancel it!